Your furbaby deserves a special treat for Dexmas, DogMomDay, or Just Barkause! 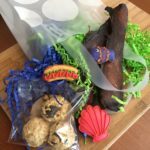 Our gift bags include 3 crunch cookies, 3 mini decorated cookies, and an ounce of jerky.Perfect for small business gifts, stocking stuffers, barkday party bags and many more! Holidays, Bark Days, or Wednesdays call for a special treat for your fur baby! Our gift baskets contain a variety of treats. 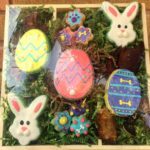 You can tell us some of fluffy's favorite treats to include or let us surprise you!Call for custom basket pricing.